Our Beloved Favorite: Stone Island | ¡VidaMaz! Smiling, welcoming faces who greet us in this lovely little town. Number of ambulatory musicians who come by. Fishermen preparing their boats to take out in the evening, working tirelessly to repair their nets for their night’s work. Vendors and, especially, those who have the thighs to bicycle along the beach. And we love the fresh seafood, caught that day and served raw or barbecued over an open flame. Our favorite place to spend the day is Pili’s. We met Rudy, Barbara and the family of Pili’s owners when Danny was just three or four. We were introduced by our compadre, Ruben. Danny fell in love with the pretty Alhondra, who was 11 or 12 at the time, and is now married with a toddler and living in Tijuana. Pill’s makes the BEST zarandeado. Barbara sells fresh oysters and clams, and the cold coconuts are always a hit. As is a bucket of beer, or a piña colada. Me eating both, the oysters and the coconut! Stone Island is one of our favorites, and is always one of our visitors’ favorite places, too. No, it’s not an island. It’s a peninsula. 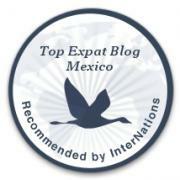 We get there from Mazatlán by water taxi. It’s part of what all of us love about going to the Isla for the day. We love how, despite Mother Nature’s havoc, the Islanders rebuild. August’s Hurricane Marie brought waist-high flooding to the places on the beach, and the water stayed for several days. 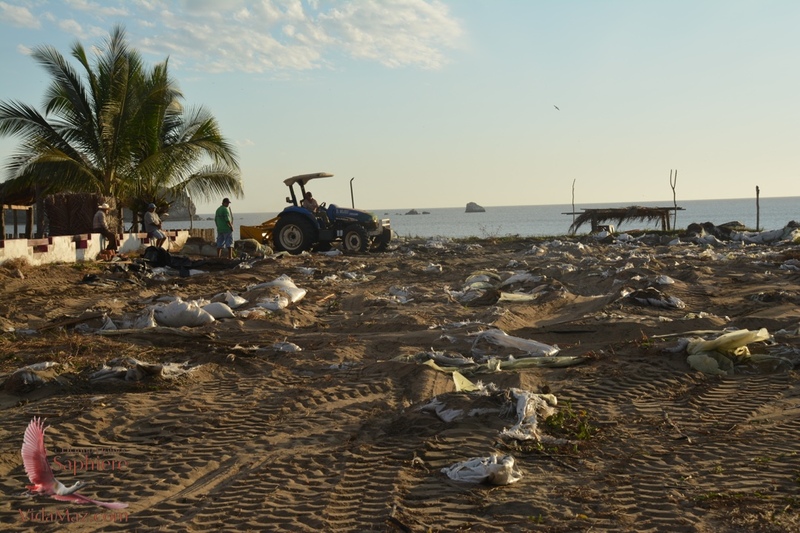 It ruined over 27 of the restaurants on the beach, and despite promises from State Secretary of Tourism, Francisco Cordova, and Mayor Carlos Felton, the islanders never saw one centavo of assistance, from either the state or the municipio. At least that’s what our friends tell us, and the Noroeste reported. Since the islanders are no longer permitted to cut down trees, they had to rescue timber from the flood waters. But they did. They have rebuilt. The restaurants, at least most of them, are again open for business. Though you can still see bulldozers cleaning up debris. How much longer will we have the serene beauty that is Stone Island, this idyllic paradise that is only a five- or ten-minute water taxi away from our daily lives here in Mazatlán? Soon they will widen and pave the road from the airport. It will be much easier for tourists, who arrive via the new highway or by air, to get to Stone Island without needing to come into Mazatlán. No doubt development will follow. And the construction of Amaitlán continues. Planned to be an eco-friendly mega-resort with lots of green space, you can see the first parts of it in the “Botanic Garden” on Stone Island. The first few rental cabañas are currently being built. Most of our friends on the Island, the ejidatarios, are excited about Amaitlán. They believe it will bring them jobs, income, sustainability for their families and the environment on the island. I am much more skeptical. But, I have my fingers crossed. I can hope. I do know that I would love to stay in one of these little cabañas, amidst all this lush, gorgeous greenery, assuming I could afford to do so. I guess this post is really a homage to one of our absolute favorite places on earth these past 35 years. Nostalgic, because we don’t want it to change. Hopeful, as we pray things will change in sustainable ways that support the environment and local residents. Let me close this post with a great story that Rudy told us during our last visit. He tells us that there was a rainstorm recently during which it rained fish—un aguacero de peces! And, even though they were drinking when this event occurred, he swears it really happened. Furthermore, Rudy told us that it wasn’t the first time it’s rained fish here in Mazatlán! According to him, El Sol reported years ago about a rain of fishes in Playa Sur ( was unable to find such a story on the internet). Our interview took place during a perfect day on the beach, but somehow the ocean breeze caught my camera’s microphone. My apologies. I’ve done all I can to minimize that windy sound… The story is great though, so, heeere’s Rudy! ← Post and Ship – A lot more than meets the eye. I’m renting a house on Stone Island this winter and loving it! It’s the best of all worlds, a small vibrant community with most of the services I need, but just minutes from a large city with whatever I’m missing. Isla has a surprising number of services, a lot more than expected. The grocery store is quite good for the size of the community and I get tortillas, vegetables, and water delivered right my door! I could do without the vendors on the beach (although I am starting to be recognized as a long-term resident and getting hassled less), the roosters at 4AM, and the gas delivery guy (whom even my Mexican neighbours find obnoxious, which says a lot! 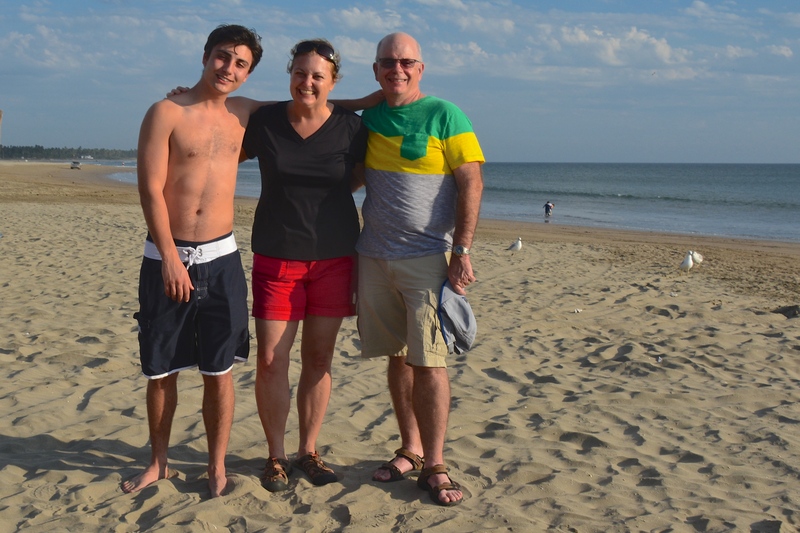 ), but I love the miles of beach to walk on, the restaurants (Miguel’s is a favourite), and how friendly and welcoming everyone is. I’m just about certain I’ll be back here for a second winter! How wonderful to spend the winter out on the Island, Rae. Good for you! We love our walks from the malecón to the beach, looking at the houses and the shops. So glad you are enjoying yourself and will be back! Thank you for joining us here! Agreed. Right now, the Botanic Garden is absolutely gorgeous, and seems to be a wonderful addition to Stone Island. If that amount of green space, and quality of care, continue, Amaitlán will, indeed, be gorgeous. How sustainable and eco-friendly, and how helpful to the ejidatarios, are other matters. Fingers crossed! Would be great to have a model project of sustainability here in Mazatlán. Thank you for the kind words about the article and photos!